Peter Bore hit a fine hat-trick as Grimsby Town dished out a hammering to shambolic Mansfield Town. Bore netted from six yards to open the scoring and Michael Coulson doubled the lead with a deflected 25-yard strike. Rob Duffy's header gave Stags hope but Bore's second close-range effort and Alan Connell's free-kick made it 4-1. Mansfield's Louis Briscoe smashed a 30-yarder but Darran Kempson's header and another Connell free-kick made it 6-2 and Bore's 18-yard shot sealed the win. 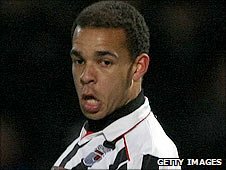 Grimsby: Arthur, Wood, Kempson, Atkinson, Ridley, Bore, Cummins, Sinclair (Hudson 77), Coulson (Eagle 72), Ademeno (Peacock 61), Connell. Subs Not Used: Croudson, Garner. Goals: Bore 5, Coulson 7, Bore 51, Connell 56, Kempson 69, Connell 81, Bore 89. Mansfield: Pilkington, Cook, Day, Grand, Sandwith, Briscoe, Istead, Murray, Smith (Mitchley 70), Duffy, Parker (Connor 59). Subs Not Used: Collett, Mills, Naylor. Booked: Murray, Briscoe, Grand, Cook. Goals: Duffy 44, Briscoe 57.